I’ve not added any photos to this post. Instead I’d like to direct you to the website of Charlie Zahm, an absolutely fabulous singer and guitar player I was lucky enough to see perform today at the Methodist Church here in Mystic CT.
I’d estimate there were approximately 100 attendees on this beautiful sunny Sunday afternoon. The windows of the church were wide open and the sea breezes blew in while Charlie’s music flew out. What a treat for the neighbors! Two hours of non-stop Celtic, nautical, and a multitude of other musical treats including some of his original works. He invited us at times to sing along, whistle along with and clap our hands to the rhythm of some of the songs. Yes, he was wearing a kilt made of Nova Scotia tartan and no, I did not ask the inevitable question. If you have a chance to visit any Highland Games, Celtic Festival or performance where Charlie is featured, please try to attend. You won’t be disappointed! There is a list of his upcoming appearances on his website. That’s it, I just wanted to share my afternoon with you. And yes…more rain tomorrow! “Road Trip” The Strawberries are ripe! 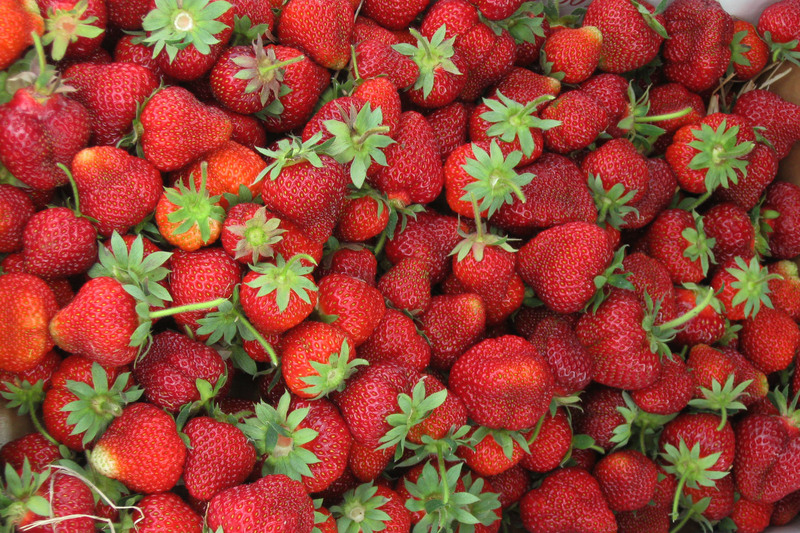 Should you be fortunate enough to live in Connecticut AND love strawberries you need to get over to the Lyman Orchards in Middlefield Connecticut ASAP! I had received an email from them that the strawberry patch (read acres) was open for PYO (pick your own) daily. Last night I emailed a friend and fellow strawberry lover that I was planning to pick berries this morning and invited her along. AFF is also a self proclaimed Luddite who is expanding her horizons and experiences almost daily. She was driving and I was the right seat co-pilot. Since I was in need of cash before we left on our adventure we stopped at a nearby ATM. As we drove away, she told me that was her first experience with an ATM! Then we were on our way to Middlefield by 9:30 and were in the field by 10:15. 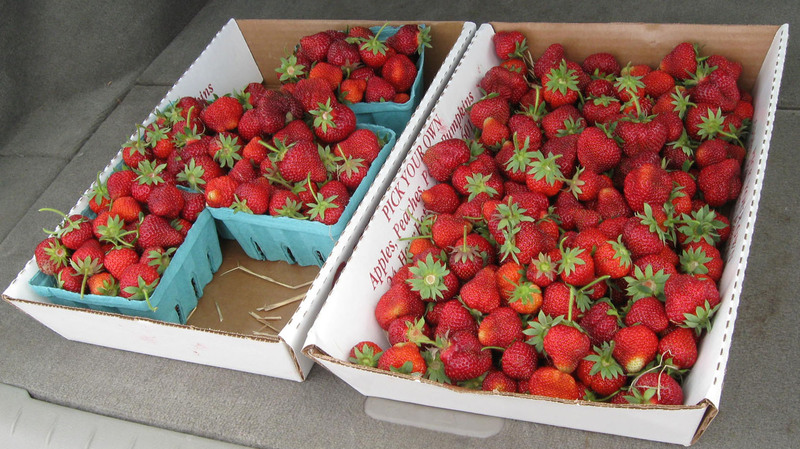 We had passed a number of people who were leaving with mounds of berries and learned from one couple that they had picked what looked to be 6 or 7 quarts of these red beauties in about 20 minutes! We weren’t quite as speedy picking as they had been but by shortly after 11:00 we were heading for the car loaded with beautiful berries. We had a very tasty lunch and cooled off at the “Apple Barrel” there on the Lyman Orchards property. The weather guessers got it wrong again you see. They had proclaimed a dense cloud cover all day. Reality was a blue sky, puffy white clouds and sunshine. Retracing our steps toward home, we made a detour to view the Wadsworth Falls in one of Connecticut’s beautiful state parks. Lots of water flowing over the rocks. This was followed by a quick trip into the Aldi supermarket where we each bought hydrangea bushes. Once home we had to plant my hydrangea bush then it was AFF heading home and me heading for the shower. And yes I have quart bags of berries in the freezer and refrigerator and my younger daughter is heading to her home with a bag with 2 quarts of berries. A good day was had by all!